Viet Nam has made unceasing and serious efforts to exercise all of its agreements on land border with neighboring countries to ensure a border of peace and stability, to safeguard the border line and all border markers as well as law and order, said Deputy Foreign Minister and Chairman of the National Boundary Commission Le Hoai Trung. Highlights in land border management of the past year? On the Viet Nam-China land border, the two sides have closely coordinated in border management and protection as per the Land Border Demarcation Protocol, the Agreement on Border Management Regulations and the Agreement on Border Gates and Border Gate Management. At the same time, other bilateral border management mechanisms, including the Viet Nam-China Land Border Joint Committee, the Cooperation Committee on Viet Nam-China Land Border Gate Management, the Joint Working Committee between Viet Nam’s Ha Giang, Quang Ninh, Lang Son and Cao Bang provinces and China’s Guangxi Zhang Autonomous Region, and border-base representatives, have well performed their assigned roles and tasks. Joint activities such as border patrol, borderline bush clearing, information exchange, cooperation in cross-border fight, hotline exchanges, and twinning of border villages, have been effectively implemented. In March 2017, heads of the two countries’ governmental delegations on border negotiation met to discuss border and cooperation issues for mutual development. 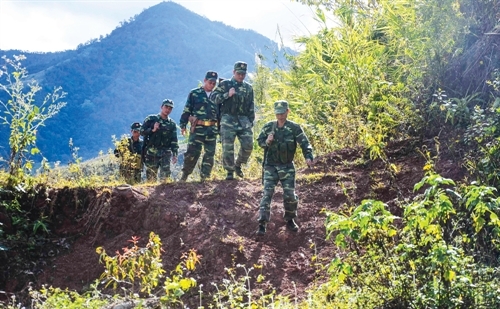 Later in September, the fourth Viet Nam-China Border Defense Friendship Exchange was successfully organized in Viet Nam’s Lai Chau and China’s Yunnan provinces. Also in that month, the two countries held ceremonies to inaugurate Bac Luan (Beilun) bridge II in Quang Ninh province and open a freight route connecting Vietna and China at Huu Nghi international border gate in Lang Son province. On the Viet Nam-Laos border, the two sides completed all internal and external procedures for the two important legal instruments on border issues – the Protocol on Borderline and Border Markers and the Agreement on Land Border and Border Gate Management Mechanisms to take effect on September 5, 2017. Last year, Viet Nam and Laos held the 27th annual border meeting between their border delegations to review the implementation of the Bilateral Agreement on National Border Regulations and the minutes of the 26th meeting. The two sides also set down orientations for bilateral coordination in the state management of border and territorial issues in 2018. In 2017, Vietnamese and Lao border localities and functional forces actively coordinated with one another in conducting patrol and control activities, exchanging information and dealing with incidents emerging in border areas. Meanwhile, people-to-people exchange and cooperation, goods trading and health care and experience sharing between border localities were maintained in accordance with relevant laws of both countries. Regarding the Viet Nam-Cambodia borderline, the two countries worked closely to manage the borderline under the 1983 Agreement on the Border Regulations, the 1995 Press Communiqué and other relevant documents, and well handled incidents in the border areas. By the end of 2017, the two countries had completed 84% of the border demarcation and marker planting work. Prompted by the Minister’s direction, ministries, sectors and localities had enhanced the Viet Nam-Cambodia land border management, become fully aware of the importance of the reality-based management of borderlines, and firmly protected the attained outcomes of border demarcation and marker planting work. What did we do in 2017 to settle border, territory and sea and island disputes and protect national rights and interests? In furtherance of the Resolution of the 12th National Party Congress on resolvedly and persistently struggling to firmly safeguard national independence, sovereignty, unity and territorial integrity, last year, Viet Nam exerted great efforts to solve remaining border, territory, sea and island-related matters and to safeguard the country’s sovereignty, sovereign rights and jurisdiction. As I have mentioned above, by the end of last year, Viet Nam and Cambodia had completed more than 80 percent of the border demarcation and marker planting work. The two sides are now actively accelerating the implementation of necessary formalities to legalize these achievements as soon as possible, along with identifying and building 1,722 auxiliary border markers right in the first quarter of this year. As for the remaining border sections, the two sides have been working hard together to find out fair and reasonable solutions to address all existing problems on the basis of signed bilateral boundary agreements. We hope to soon finish the border demarcation and marker planting work so as to build a shared border of peace, stability, friendship and comprehensive cooperation for the prosperity of the two peoples. Last year, the situation in the East Sea was relatively stable without serious incidents. However, there emerged new complicated developments, posing latent risks and unforeseeable challenges and drawing public attention and concern around the region and the world. Against this backdrop, Viet Nam remains persistent and determined to fight against violations, safeguard the country’s sovereignty, sovereign rights and jurisdiction over our maritime zones, continental shelf and islands on the basis of the international law, including the 1982 United Conventions on the Law of the Sea, while taking advantage of the international support for our just standpoint and protesting acts that complicate the situation. In 2017, Viet Nam maintained and promoted negotiation mechanisms on marine issues. With China, a talk between the two countries’ governmental-level border negotiation delegations was held in March, in addition to three negotiations and four informal meetings of the working groups on Viet Nam-Chinas marine issues. Viet Nam also kept its efforts to protect its sovereignty over the Hoang Sa (Paracel) and Truong Sa (Spratly) archipelagos, promoting cooperation to settle marine issues with the parties concerned so as to affirm its sovereign rights and jurisdiction over the exclusive economic zone and continental shelf in the spirit of the supremacy of law. Also in 2017, Viet Nam conducted negotiations on delimitation of exclusive economic zones with Indonesia and held talks on marine issues with Malaysia. The country also joined hands with ASEAN countries and China to work on a Code of Conduct in the East Sea framework and expressed its viewpoints at multilateral forums such as the ASEAN and the United Nations. The country has also actively and proactively exchanged experiences and expanded cooperation with countries in and outside the region in order to seek a common voice in marine issues, further strengthen friendship and trust with related countries. 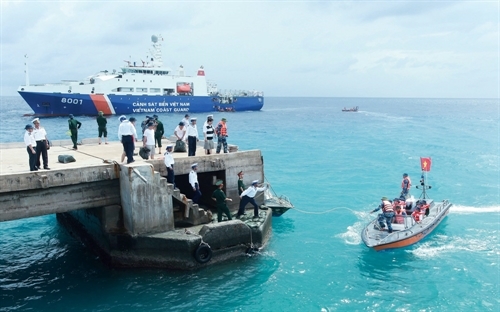 At the same time, in order to guarantee our lawful rights and interests, the Government has directed relevant agencies to take comprehensive measures to support and protect fishermen operating in Viet Nam’s territorial waters, appropriately handle issues concerning Vietnamese fishermen’s encroachment upon others countries’ waters, and prevent foreign fishing vessels from illegal operation in Viet Nam’s sea. In your opinion, what is the significance and importance of border-related work to socio-economic development? One of the key tasks of border and territory-related work is to cooperate with neighboring countries to manage borderlines and border markers as well as create conditions for people, especially border residents, to live stably and develop production, contributing to socio-economic development and national defense and security assurance. This is also a foundation for building borderlines of peace, friendship, stability and cooperation for sustainable development. Over the past year, apart from working on border-related issues, Viet Nam and related countries have actively exchanged information and sought solutions to boost economic, cultural and social development in border areas. With China, in November 2017, the two countries signed two memorandums of understanding on accelerating negotiation on the Framework Agreement to build the Viet Nam-China cross-border economic cooperation zone and on promoting connection between the “Two Corridors, One Belt” framework and the “Belt and Road” Initiative. Last year, the two sides completed procedures to officially open a number of pairs of border gates, crossings and customs clearance points so as to facilitate socio-economic development in border localities. The Ministry of Foreign Affairs is working on a plan on development of Viet Nam-China land border gates in the 2016-2025 period, with vision to 2035, with a view to ensuring effectiveness of the opening and upgrading of border gates between the two countries. With Laos, the two countries are joining hands to draw up a master plan on developing the Viet Nam-Laos border gate system to 2025, with vision to 2035. At the 27th annual border meeting last year, the two sides also discussed the development of the border gate system and economic, cultural and social cooperation in border areas. In addition, Viet Nam and Laos continued to sign many bilateral agreements to connect roads and facilitate cross-border transport. The two countries basically finished a pre-feasibility study on the construction of the Ha Noi-Vientiane expressway and a policy plan to enhance cultural and sport exchange and tourism development in border localities. As for Viet Nam-Cambodia border, a joint working group on border gate issues has been established to share information on the opening, upgrading and development of border gates in compliance with relevant master plans to better serve socio-economic development in the two countries in general and border areas in particular. These efforts have contributed to stabilizing and boosting socio-economic development, especially improving the economic, cultural and social lives of border residents, creating a solid foundation for developing borderlines of peace, stability, friendship, cooperation and sustainable development between Viet Nam and neighboring countries. What are the major orientations for border and territory-related work in 2018? In 2017, many changes unfolded in the world and the region, bringing about both opportunities and challenges. In this context, border, territory, and sea and island-related work still recorded outstanding achievements, actively contributing to obtaining the objective of maintaining a peaceful, stable and favorable environment for development and fulfilling the tasks of national construction and defense. This year, the East Sea situation is expected to see complicated developments and uncertainties threatening peace and stability in the region and the interests of related countries. Hence, border and territory-related work will focus on maintaining a peaceful and stable environment, while defending national territory and sovereignty. To this end, we should well manage the Viet Nam-China land border in conformity with signed agreements, keep a close eye on and timely handle any incidents that may occur along the borderline. At the same time, we will try to complete the increase and upgrading of Viet Nam-Laos border markers and coordinate with Cambodia in speeding up the legalization of the two countries’ obtained results of land border demarcation and marker planting. Viet Nam will hold more talks so as to obtain substantial results in the resolution of marine issues with related countries, take an active role in negotiations between the ASEAN and China on building a Code of Conduct in the East Sea, enhance marine cooperation with related nations in the East Sea, and fight against infringements upon national sovereignty and sovereign rights in line with international law, including the 1982 United Nation Convention on the Law of the Sea. Over the past years, under the leadership of the Party and State, together with the determination of the entire people, cadres and soldiers, Viet Nam has made the full use of opportunities and overcome difficulties to firmly maintain border security and national sovereignty over sea areas and islands, protect the country’s lawful rights and interests and ensure a peace and stable environment for national construction and defense and deeper integration into the region and the world.